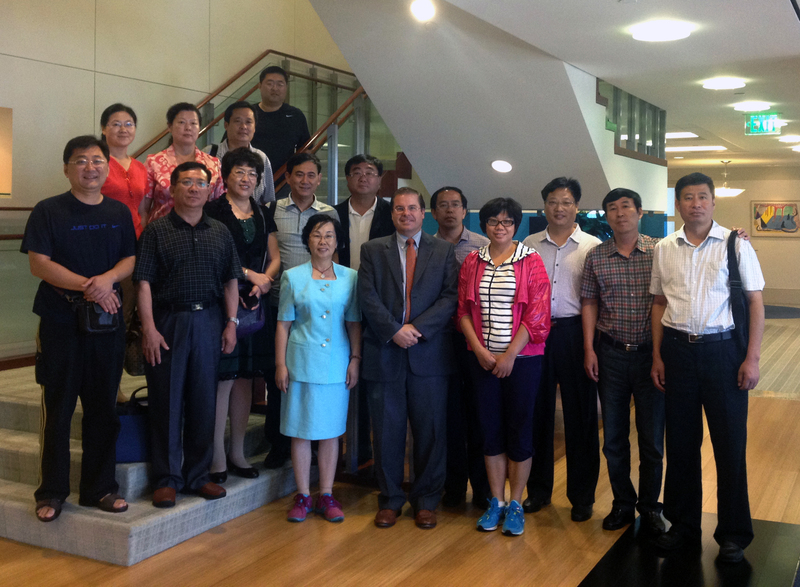 LOS ANGELES — Jeffer Mangels Butler & Mitchell LLP (JMBM) hosted 18 senior judges from China’s Shandong Province at its offices in Century City. JMBM bankruptcy partner David Poitras provided them with a two-hour lecture and discussion on U.S. commercial bankruptcy and reorganization. The delegation of judges, representing courts throughout Shandong Province, were participating in an International Training Program (ITP) through California State University, Long Beach. “At the conclusion of the program, it was clear that the judges had a much better understanding of how business bankruptcies work in the United States,” said Anthea Xu, ITP’s program manager. She noted that the information could be valuable as business reorganizations develop in China. David Poitras specializes in representing companies and individuals in all areas of bankruptcy (debtors, creditors, creditors’ committees, asset acquirers, investors and trustees), receiverships, assignments for the benefit of creditors and out-of-court financial restructurings, throughout the United States. In his financial restructuring practice, he has represented numerous financial institutions, private equity lenders, investment banks, public and private corporations, municipalities, limited liability companies, partnerships, and individuals across a wide expanse of industries, including aerospace, airlines, audio and video, automotive, auto rental companies, apparel, building supply, construction, entertainment, food service, franchisors, furniture, healthcare, hospitality, import/export, jewelry, manufacturing, oil and gas, plastics, printing, post-production, professional service firms, real estate, retail, software, sub-prime mortgage lending, technology and textile. Jeffer Mangels Butler & Mitchell LLP (JMBM) is a full-service law firm committed to providing clients with outstanding results. JMBM is an AmLaw 200 firm and was named to the National Law Journal’s Mid-Size Hot List (2012), one of 20 mid-sized law firms nationwide. The Firm’s bankruptcy group represents debtors, creditors, trustees, creditors’ committees and investors. From our offices in San Francisco, Los Angeles and Orange County, we serve our clients’ needs worldwide. International Training Programs (ITP) has been offering a variety of programs to people from different countries. Its goal is to bring out academic and professional programs to global audiences. The program is dedicated to actively promoting academic and cultural exchanges internationally by fully utilizing the abundant resources and expertise of the University and strong support of the community.